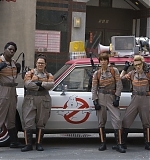 It’s finally here – the first official picture of the new Ghostbusters in full gear! Paul Feig tweeted (he’s been on a roll lately, hasn’t he?) the picture, which has since been posted on every media outlet there is. I have added that image and a couple more pics from the set to our photo gallery. Click on the previews below to see them all in full size. Ghostbusters arrive in theaters on July 22, next year.